5 So, Should I Get It? It would not be wrong to make a comparison to the Wii nunchuk attachment. The Zeemote is almost functionally identical. 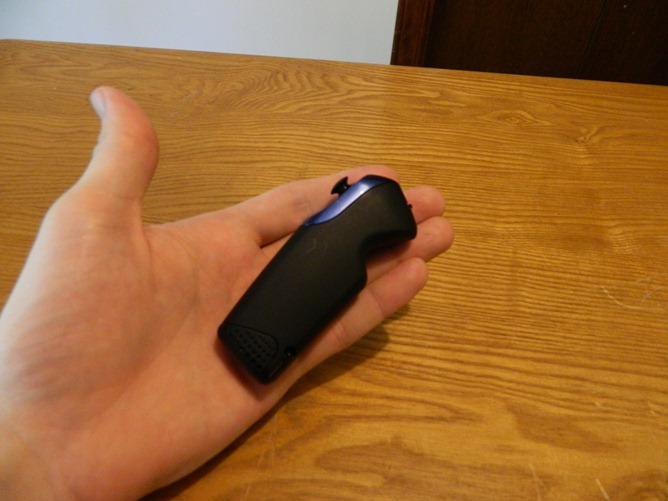 Held in one hand, the device has two small trigger buttons next to the index finger, an analog control stick for the thumb, and a recessed trigger button by the middle finger. And when we say recessed, we mean it. 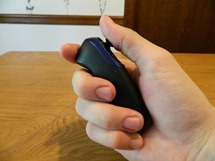 As in, if you want to press this button, you need to get the tip of your finger right up against it. Thankfully, most games don't use it, but if one does, it's obnoxious enough to make the whole thing not worth using. Of course, it's not perfect to use anyway. The controller is extremely tiny. I don't have large hands, by any means, and I found that holding the controller was a little uncomfortable. Not so tiny I couldn't use it, but I can imagine that others with larger hands would be unable to use it. There are quite a few games available for the Zeemote. Some are pretty great, some not so much. Old favorites like Running Fred and SpeedX are compatible with the controller and, in my opinion, are much easier to play with real buttons and control sticks. Then again, I come from the old days when we had buttons. Not like you kids today with your fancy magic dances. Unfortunately, there's still a bit of a shortage of games. For starters, because the controls are significantly different on the Zeemote than a touchscreen, there's only a handful of games that can be made to work with the controller. Running Fred is great, but Angry Birds would be impractical. There also doesn't seem to be a flood of developers rushing to support the controller. We'd like to see more of these games come out (as well as more accessories like this). If you're a game developer, you may want to get in contact with the folks behind the Zeemote. They're very willing to work with developers to get more games supported. I actually found that the best way to use the Zeemote was with a tablet and a stand. This play style brought back unexpected and unnerving memories of playing the old Virtual Boy, only this was more fun. Sorry, Mario Tennis. The Zeemote works just as well with phones, but it seems a little odd to use a controller that fits in your hand to play a game on a phone that also fits in your hands. While the controller works great for gameplay, you still need to be within touching distance of your device for other onscreen controls. Sure, Fred can run, jump, and die with the Zeemote, but if you want to spend those Skullies, you'll need to use the touchscreen. It would be interesting to see some additional accessories that could add some more controls. Or even for the Zeemote to be used for more than just in-game controls. The Android OS has (or at least had?) support for trackballs so it doesn't seem like it would be difficult to use some kind of rudimentary control scheme. Obviously it wouldn't replace a touchscreen, but it might be cool to dock a tablet into a home theater and play games on it like a console. Unfortunately, the controls just aren't there yet. Due to the unprecedented contest we ran this month, it feels necessary to review this device from two different price points. For the thousand of you who received a free Zeemote, this is going to be fun. There's a wide enough variety of games available that everyone can find something fun to play with it. There aren't a whole lot of games, but there is a nice variety. For everyone else, though, we have to judge this device as the $30 accessory it is. Unfortunately, that's a lot harder of a decision to make. At $20 I might give this a glowing recommendation. For $30, though, it feels harder to justify. 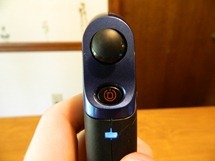 The design of the remote is good, but not great, and the selection of games that have elected to add support is similarly average. The company behind the Zeemote seems to be eager to work with devs to improve the selection of apps to support the controller, but the market is small. So, Should I Get It? This one earns an unqualified and resolute, "Maybe." Games like Running Fred are insanely fun already and the Zeemote just feels like a better control scheme. On the other hand, $30 seems just a tad high. If you scored one of our 1,000 free controllers, you're going to like it. If you're wondering if you should buy one, you might want to take a look at the games that are available now, or wait to see if more developers pick it up. More than anything though, accessory makers, please keep making things like this. 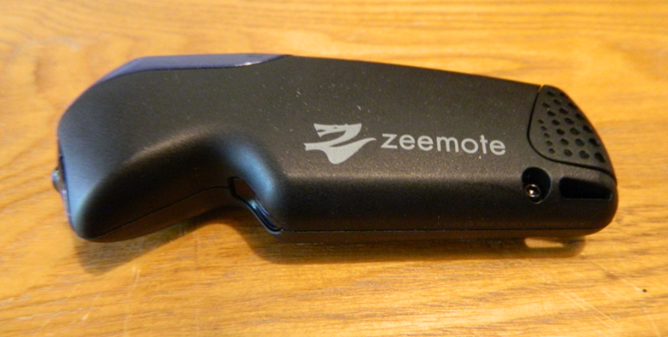 For all its flaws (seriously, this recessed trigger button just bugs me), the Zeemote is one nifty device. 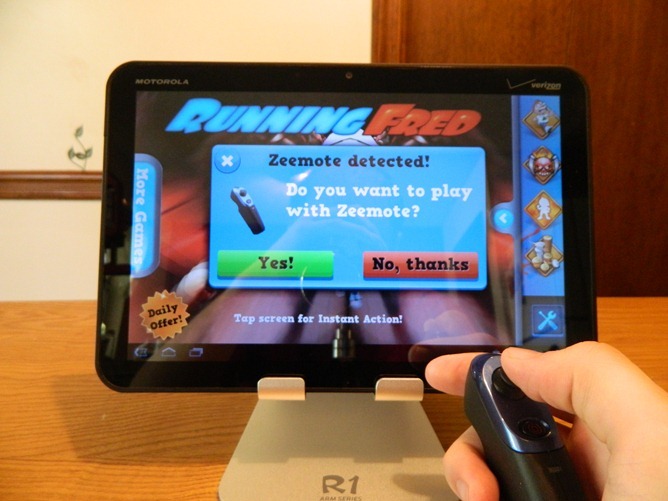 Things like this, or OnLive's controller, are really exciting for Android as a gaming platform. Android is the OS that can be anything, so why shouldn't it be a game console, too? So, please, accessory developers, don't stop making Zeemotes or Kinocts or Gyrates. This is the kind of stuff we like to see.